On your turn you may move one of your adventurers by playing a card from your hand of five. Mostly that allows you to move a fixed number of step forward, some cards make you roll the dice or allow you to move a single step backwards. “But that’s not new!” I hear you yell. Well, no. The new thing is that you can only play the two outside cards in your hand. The new card you draw is added in the middle. You’re obviously not allowed to reorder cards in your hand. This tiny twist makes picking a card more than a one-dimensional decision. It’s not only about where you want to move now, it’s also about the card that becomes available for your next turn. That, in turn, meshes well with the rest of Luxor. When moving, you only count spaces that still have a tile on them. Many tiles are removed during the game. That two in your hand might take you further next round. On the other hand, another player removing a tile that you counted on being there may mess up your next turn because now you’ll move too far. And on top of that, what tile you want to get to should feature in your decision as well. Most common are treasure tiles. You have to get the right number of your own meepventurers on those tiles to collect them. You gain some victory points immediately, and for every set of vase, jewelry and statue you’ll score more points at the end of the game. Some treasure spaces remain empty, shortening the way through the temple. Others are refilled with temple tiles with different special effects. You might, for example, find a tunnel that lets you move forward to the next tile with a tunnel. 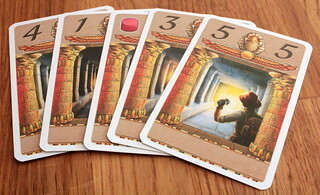 Next, there are Horus tiles where you pick up special movement cards. Those might let you pick freely how far you want to go, or they might move all your meepventurers. They still follow the normal rules, though, so you add them in the middle of your hand and have to get to them to use them. Alternatively, you can pick up a key on a Horus tile, the only way to enter the burial chamber. Keys sound important, but the game ends when two meepventurers have entered the chamber. It’s a perfectly sound strategic decision to forego keys and burial chamber and collect your points another way. Finally, there are the rather boring Osiris tiles. All they do is move a meepventurer that lands on them an additional number of steps forward. 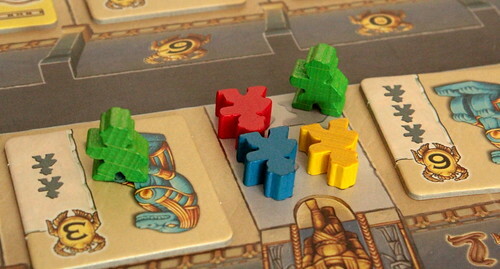 Other than different tiles there is one more feature of interest on the board: the three statues of Anubis. You start the game with two of your meepventurers in play. When you pass a statue of Anubis you start another one at the entrance of the temple. They’ll have to do some catching up, but between the disappearing tiles and the tunnels you may have discovered that’s hardly a problem. Quickly moving them further into the temple is important. As mentioned above, the game ends when two meepventurers have reached the burial chamber. When that happens one source of points is how far each of your meeple has advanced into the temple. The two players to enter the chamber get some bonus points for finding the two sarcophagi on top of the points for reaching the center of the temple. Some more points for sets of treasure tiles, some for scarab tiles, add the points you already got for treasure tiles when you collected them, stir gently and you have a winner. Up in the introduction I made it sound like Luxor is full of extra hard decisions. In a way, that’s true. The decision which card you play has many implications. At the same time, you decide between two cards. Two options, no more. No player powers. No secret special action tiles. You pick one of two cards. This split between only two options but many consequences sounds like it shouldn’t work. 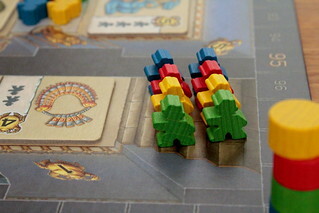 In fact, for a family game like Luxor it works splendidly. The two options will not overtax an eight year old, and the luck of drawing movement cards works well as an equalizer. At the same time, you always feel in control. Everything that happens comes from your decisions. Luxor also gives you something too many family games are still missing: different ways to victory. You can play Luxor as a race to the burial chamber. If you get two of your own meepventurers there quickly enough, those points might be enough. Or you might lose to a player that went slowly and collected treasure tiles. 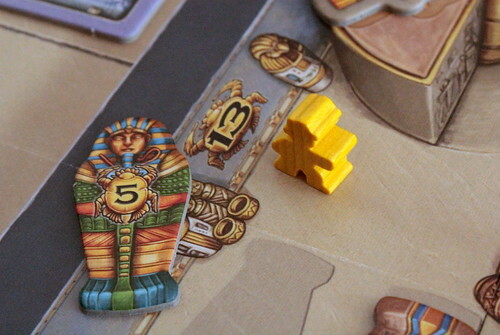 At the time of writing we already know that Luxor didn’t win the Spiel des Jahres. Azul did. But Luxor was without a shadow of a doubt a worthy nominee.